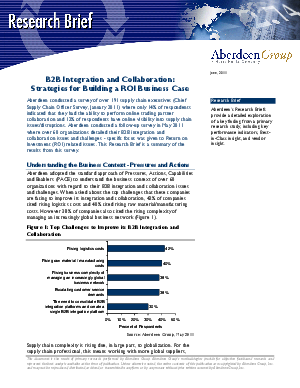 A just published report by the Aberdeen Group reveals that companies who have implemented comprehensive B2B Integration programs are reaping huge benefits, including improved customer service levels, higher order accuracy and on-time deliveries and better gross margins. This aligns with the metrics we receive from our customers, who typically experience fast and significant results with integrated suppliers and customers. This Research Brief is a summary of the results from this survey.